31 January 2016 – The international community must stand with the people of Ethiopia in their time of need, Secretary-General Ban Ki-moon said today, urging donors gathered in Addis Ababa to step up assistance to the country, before heading to the drought-stricken region of Oromia where he witnessed first-hand efforts under way to battle the effects of one of the most powerful El Niño events in recorded history. 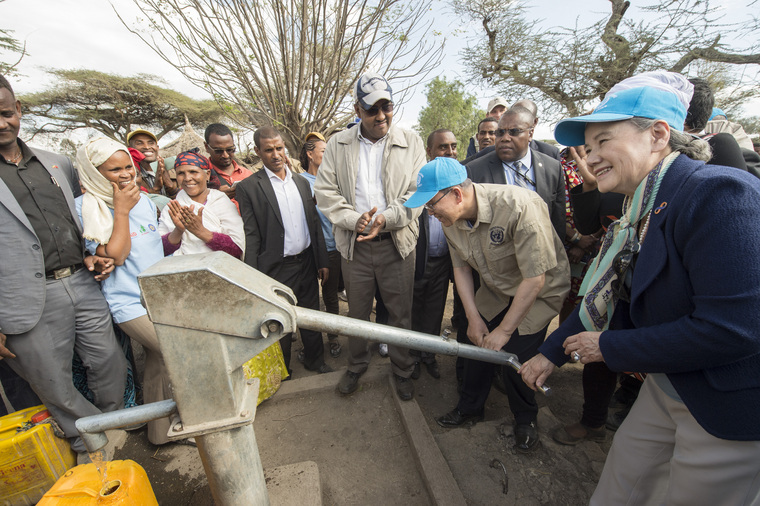 “The people of this beautiful country are facing their worst drought in thirty years,” Mr. Ban told participants at a donors humanitarian round table convened in the Ethiopian capital in the margins of the 26th African Union Summit. 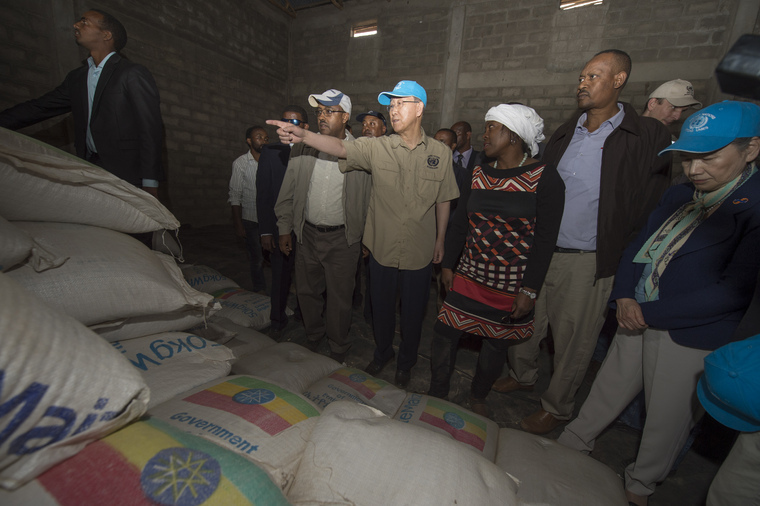 Later in the day, the Secretary-General visited the drought-stricken Oromia region with the Deputy Prime Minister of Ethiopia, Demeke Mekonnen, and Ertharin Cousin, the Executive Director of the UN World Food Programme (WFP). Saying that he was “very moved,” Mr. Ban visited a health post, a water borehole and a food distribution and cash transfer point. “This is a very moving experience for me as Secretary-General to witness myself how the Ethiopian Government and the United Nations agencies, the World Bank, all humanitarian workers are working together to address difficult challenges,” he said noting that the area has been seriously impacted by long spells of drought caused by El Niño climate phenomenon. “It is important that the Government is leading this response and the United Nations is now helping: it is quite moving,” he reiterated. He said he was very much grateful to all humanitarian workers at the small health post where he had seen health workers distributing vaccines, and providing check-ups. It was impressive to see that malnutrition levels had dropped significantly and that people had been saved from malaria. “The United Nations is committed to help Ethiopia to overcome this challenge. This challenge may last some time but with continuous concerted efforts, I think we can overcome – and I am very much moved to have seen how hard we are working,” said Mr. Ban. In the Ethiopian capital, he told the donors’ meeting that the scale of the emergency is too much for any single Government. “The impact of El Niño is unpredictable, but experts say it is likely to affect food security for the next two years,” he stressed. “The Government of Ethiopia has shown remarkable leadership in this drought response. It has made the greatest financial contribution, allocating more than $381 million to the crisis so far,” said the UN chief, noting that the Government-managed Productive Safety Net Programme, in partnership with the World Bank, aims to assist some eight million people with emergency food and cash transfers. Yet, while the United Nations boosted early action through some $25 million from the UN Central Emergency Response Fund (CERF) in 2015, more is urgently needed. “Immediate support for Ethiopia will save lives and avoid preventable suffering. Immediate support will also safeguard the impressive development gains that Ethiopia has made over the past years and decades, Mr. Ban explained. Such support would also strengthen Ethiopia’s national distribution channels and social support networks, and build resilience for the future, he underscored. Noting that the Sustainable Development Goals (SDGs) agreed by UN Member States last year are based on the promise to leave no one behind, the Secretary-General said that humanitarian crises are the main reason why some 100 million people are currently “left far behind,” in the Horn of Africa and elsewhere. “The World Humanitarian Summit in Istanbul on 23 and 24 May will be an opportunity to ensure that we start supporting those furthest behind first,” he noted and expressed the hope that the participants at today’s event are already engaged in the Summit process. “We need to hear your voices in Istanbul,” he said. By contributing to humanitarian aid, donors are helping to fulfil the international community’s pledge to the most vulnerable. Support for the Ethiopian Government and people through the current crisis will be a critical test of our commitment to implementing the SDGs, stressed the UN chief. “Until it does, I urge you to make the investment that is needed now, to support the Ethiopian Government and people through the difficult times ahead, and to build for the future,” said the Secretary-General.